Christina Bang loves her 8-year-old stepson, Michael, like her own child. There isn’t anything she wouldn’t do for him. So, when she was faced with any empty refrigerator ahead of one of Michael’s weekend visits and had no money for food, she didn’t hesitate to ask for help. She went to her local church and did research online and found the Keystone Community Services food shelf. “When I first told my mom that I was applying for SNAP [formerly food stamps] she was shocked, but I was going through a rough period, and I reminded her of what she always told me when I was a little girl: we shouldn’t judge people,” she said. Christina grew up in an upper middle-class household in Stillwater and admits she had preconceptions about people who used food shelves. That was nearly two years ago. Christina has since visited the food shelf from time to time when money is tight, and she needs food for Michael. Christina isn’t alone. Fresh produce, dairy and lean protein are some of the most requested items at food shelves. 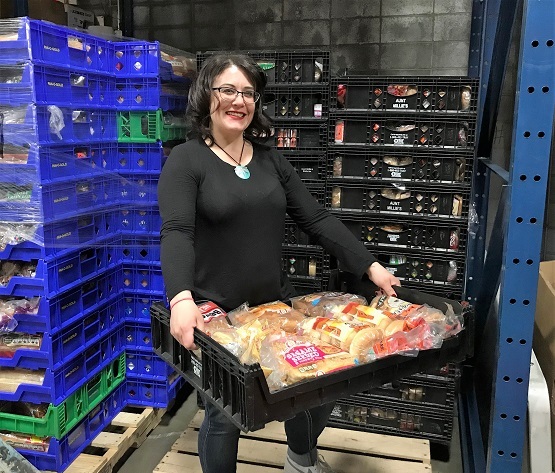 Second Harvest Heartland and its hunger-relief partners are working to increase the availability of these healthy foods through community partnerships and a new hunger-relief campus with greater cooler capacity in Brooklyn Park. Now that she has a full-time management position, Christina no longer needs to use the food shelf to feed her family. She and her boyfriend, Anthony, have even started to remodel their home. Although because of their tight budget, they’re doing it at a snail’s pace, which is fine by Christina. She’s just grateful. On a recent trip to Menard’s to purchase supplies, Christina noticed a sign for Second Harvest Heartland. She recognized the name from a package of food she’d received at the food shelf. The assembly line volunteer position is a perfect fit for Christina, who loves to talk, and always finds the conversation with fellow volunteers interesting. Christina’s big-heartedness has rubbed off on her stepson. Michael recently decided to donate the toys he no longer plays with. When he gets older, Christina plans to take Michael with her to Second Harvest Heartland to volunteer. In the meantime, he finds other ways to give back. The only positive part of hunger is that it's a solvable problem. Start with a few dollars, a few pounds of food or, like Christina, a few hours volunteering. That's all it takes to put your desire to make a difference to work. Learn more about how you can get involved. We are a member of Feeding America, a nationwide network of more than 200 food banks that helps feed people across the country.